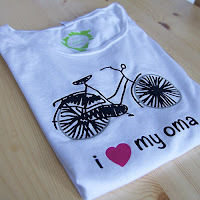 A four day organised bicycle ride, the Fietsvierdaagse, is organised in Drenthe every year. It's a social event, not a race and around 15000 people take part each year. A variety of different length routes are available every day, varying from 25 km for the RollOn Route (aimed at people with disabilities and guaranteed accessible by any type of assisted bicycle) through to the 100 km Sport edition. It's something to look forward to every year and we've taken part in this event most years that we've lived in Assen, usually taking our time and riding one of the most popular distances (40 and 60 km each day). this route overlaps one of the others. Judy and I couldn't possibly do the whole ride this year because a study tour which we're hosting for a group of students from an American university overlaps with the days of the Fietsvierdaagse, but it's a shame to miss the event altogether so I wanted to do at least a part of it. On the more popular distances, the Fiets4daagse is all about gezelligheid. Speeds are low and it can take quite a while to cover a short distance. The longer routes attract fewer / sportier people so it's possible to take part without the ride taking all day. It was a 100 km route which I rode around with a friend this morning, lots of discussion along the way, still gezellig, but as this took less than four hours we were back in time to finish eating lunch at home. It was a different way to enjoy the event and a lot of fun. The weather was fabulous, but I did slightly underestimate how much I'd drink at a temperature of 34 C so I was a little dehydrated by the end. What do you get ? A flag for your bike, and a card to get stamped at each organised stop. However, as explained above, for most people the Fiets4daagse isn't normally about getting around in any hurry at all. The wonderful conditions for cycling through the countryside here are a large part of the reason why we chose to live in Assen. Poor cycling infrastructure designs struggle when it comes to allowing cyclists to make turns across traffic (a left turn in continental Europe / USA) in a manner which is both convenient and safe. In some cases, designers simply don't really try and this results in such abominations as centre cycle lanes leading into advanced stop lines (bike boxes) on the ground. There are also examples of designs which are promoted quite hard but which don't really help people to cycle because they make turns inconvenient, dangerous or in some cases both inconvenient and deadly dangerous. for cyclists. The green for straight on is almost always lit. This only goes red to allow cyclists to emerge from the right. On the other hand, there are also good examples, though these are not necessarily so easy to find. Some designs improve both safety and convenience for cyclists. One solution for traffic lights which I'm particularly enthusiastic about because it has a very good track record is the simultaneous green junction, however there is no one design of junction which fits all locations and other good designs are possible. This new junction demonstrates a very good way to design for asymmetric cycle traffic. In this case, almost all cycle traffic heads head straight on across the junction and they have a nearly full time green light. Only the relatively small number of cyclists who turn left are stopped by the traffic light in the video and this introduces only a short delay until it can stop all conflicting motor traffic and remove all danger from the left turn. thick white line. There is no conflict in this direction either. The old junction in this location featured on my blog in 2012. This already worked well, but it stopped cyclists heading straight on relatively frequently and did not allow for a left turn to be made by bicycle. The old junction was built on land and did not incorporate a bridge. The new bridge had to be built to enable re-opening a canal which was filled in decades ago and the new junction is on top of that bridge. The Weiersbrug is one of six new bridges in Assen which began construction at the end of 2014. Five of those bridges are now complete and one remains to be built. I've been critical in the past of some aspects of the huge FlorijnAs project in Assen, but it has also brought improvements for cyclists in some locations, such as here. recently removed from the area around Assen railway station. The idea of cyclists waiting to turn left at a traffic light in this way is not in itself new. However, this new junction brings a level of refinement which makes it comfortable to use. 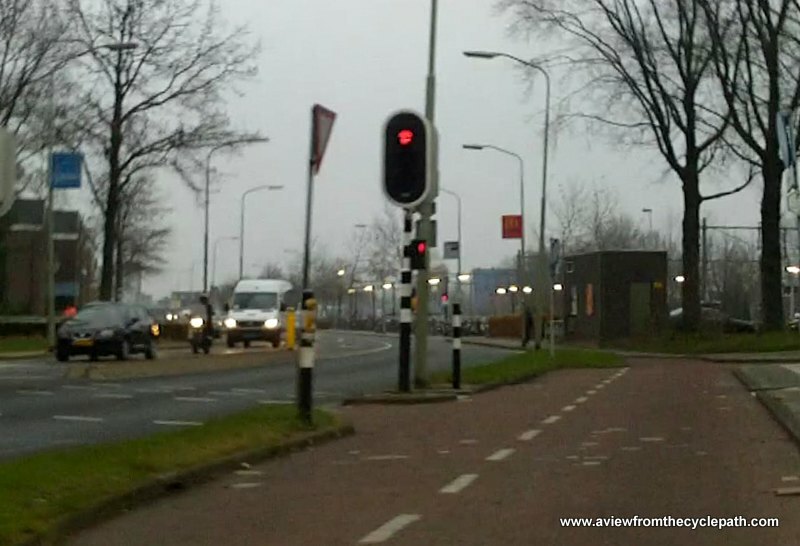 This new junction works far better for left turning cyclists than did the an older implementation of the same idea which was recently removed from the railway station area of Assen. The junction shown in the video with a blue arrow showing the route taken by left turning cyclists in the video. 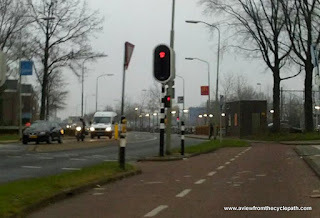 While cyclists make this maneouvre or any other across the junction which could result in conflict with motor vehicles, red traffic lights hold motorists to remove the conflict. This new junction opened in May on the second day of a follow-up study tour. There is new cycling infrastructure to see every year in Assen and the programme changes each year to allow for what has changed. Future study tours, such as the tenth anniversary tour in September, will feature this junction amongst other pieces of new infrastructure. True mass cycling, inclusive of all members of society, including children, older people and those with disabilities and where everyone makes all types of journeys by bike, is only possible with the very best cycling infrastructure. Be inspired by the best, not those things which really ought to be ignored. Ten years ago today, my friend Terry and myself started our ride from John o'Groats to Land's End in the UK. While we rode, I sent one photo per day to the 12 year old daughter Eliza from my phone (using MMS - remember that ?) and she wrote up the ride as we were on the road. When I got home, Eliza said she'd like to do the same thing and to be honest the thought of that actually horrified me. As I wrote about before, we had many close calls during our tour and I didn't want my daughter exposed to the risk. However, the desire to go on such a tour remained with her. 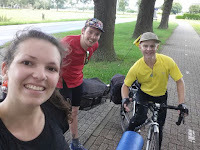 Eliza Hembrow and Sander Marskamp setting off to ride their Ronde van Nederland. Today, Eliza and her boyfriend Sander, who have already travelled the world together have set off to conquer the Netherlands. They'll ride all the way around the country, which is a similar distance to LEJOG, following their own route to pass places and people that they'd like to visit. I've no fear for their safety on a tour in the Netherlands. This time it's plausible for them to do updates on the road so Eliza and Sander will update their own blog daily during the ride. Follow their blog. Sander has a business designed, printing and selling organic cotton t-shirts using all vegan materials. Some of these are now available in our webshop. Both Eliza and Sander are riding proper steel touring bikes which are older than they are. We know the history of Eliza's bike as this is a Claud Butler mixte frame bike made of 531 steel which Judy used to ride. With a little occasional attention, bikes like this last forever. We overhauled both bikes in the last few days and with new tyres, new bar tape, new panniers, mudguards, chains and oil these bikes are riding as if new. In an update at around lunchtime, Eliza sent us a photo. She'd bumped into that same Terry with whom I rode LEJOG ten years. While Eliza and Sander head South, Terry is heading North towards us. They met each other on a cycle-path about 50 km south of here while heading in opposite directions on the same path. Cycle-paths in the Netherlands form a grid which covers the entire country. Yes, I know the brexit fallout has been getting everyone down. It's affected us quite badly too. Brexit also pushed up prices for British customers. We'd like to help by sending British customers food parcels. For a limited time and while stocks last, if you spend over €30 (ex VAT) in the DutchBikeBits.com webshop and use the "brexitfood" or "freepasta" discount codes at the checkout then you can add a bag of bicycle shaped pasta to your order for free. You don't have to be British or in the EU to get free pasta. This offer is available worldwide. It's not only ten years since I rode from Land's End to John o'Groats but also ten years since we organised our first cycling study tour in the Netherlands. The anniversary open tour is in September. Book now. In other news, I dare say many of you have noticed the news that a Tesla car with self-driving feature has been involved in the first fatality in a self-driving car. Sad news for all those involved. First off, I think it fair to say that I think there is good reason to believe that automation will result in fewer fatal car crashes than human drivers currently do. However, as cyclists we should note how the crash occurred: "Neither Autopilot nor the driver noticed the white side of the tractor trailer against a brightly lit sky, so the brake was not applied." This crash is not only the first recorded lethal incident due to a self-driving car but also appears to be the first lethal computer controlled SMIDSY ("Sorry Mate I Didn't See You") incident. If the computer can't see a truck under all conditions, can it see a cyclist ? Drivers who report not having seen a cyclist often genuinely have not seen and processed the presence of that cyclist. This can be for reason of lack of attention, bad light, being blinded by sunlight. Human failings. In this case, the error was not made by a human but by a computer which managed not to notice a truck because it was blinded by sunlight. Just as with human drivers who have made errors in the past, in this case the computer simply continued to drive at the same speed until the collision occurred. I think this automated SMIDSY rather reinforces the point which I made a while back that perfect driving can never happen. Training of drivers, threatening huge fines and even replacing them with automation will not result in perfectly safe driving. The only way of keeping cyclists safe from the danger of motor vehicles is to remove the danger of motor vehicles from where cyclists are. This can be achieved by building cycle-paths, or by unravelling routes so that cyclists encounter very few motor vehicles - that being a form of segregation without cycle-paths.